I was invited last minute to my best friend’s sister’s Halloween party and needed a quick costume idea that was small and easy to pack in a bag so I could take it on a train. I didn’t have enough money to buy a costume. I searched the house for things I could use and found an old pair of green opaque tights, which out of nowhere inspired the idea of dressing as a snake! To make the costume I cut the waistband of the tights off just above the legs (so the legs were still attached to each other at the crotch) I then stuffed the tights and sewed them together at the crotch to create a long green snake shape. I painted this with snakeskin patterns and stuck some sparkly sequins on. To create the head I painted the waistband from the tights and sewed on some sequins. I cut a snake tongue shape from red felt and sewed that onto the bottom of the hood. I wore black clothes and pinned the snake shape around my body so that the end came up to my chin. I covered my face in green face paint. 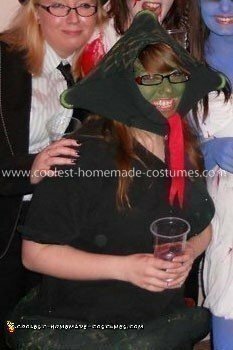 I put the waistband of the tights around my head so that my face poked out of the waist hole then hooked a green coat hanger inside the waistband at the back of my head to create the cobra’s hood.